The Internet of Things is full of devices that monitor the user’s vital signs, from wearables that remind us to breathe deeply to fitness gadgets that track the beating of our hearts. 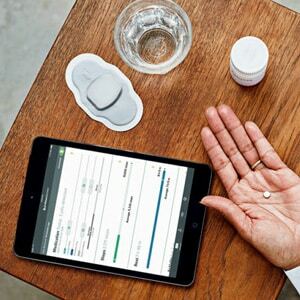 But collecting medical-grade data — and getting it into the hands of doctors — requires a special expertise, and that’s what Vital Connect, a Silicon Valley healthcare technology company, has done with its HealthPatch MD biosensor. Think of it like a bionic Band-Aid. HealthPatch contains a suite of sensors to monitor heart rate, respiration, temperature, steps taken, sleep cycle, stress levels, and whether the user has fallen or otherwise become incapacitated. Stuck to the chest, it’s at most a quarter-inch thick and runs about three days on a watch battery. When it’s time to dispose of the patch and battery, the electronics module can be removed and reused. HealthPatch pairs over Bluetooth Low-Energy with a mobile device for WiFi connectivity, so patients and doctors can access real-time data (which is encrypted and compliant with HIPAA regulations on medical data privacy). The information is available through a cloud platform provided by a cardiac monitoring partner company, LifeWatch, based in Switzerland. Continuous monitoring and 24/7 access to data gives doctors a detailed window into their patients’ health and instant notifications of any troubling signals. It also gives patients autonomy, offering at-home or on-the-go monitoring that would otherwise tether them to bulky equipment or require an extended stay in the hospital. Vital Connect received FDA approval for HealthPatch in August, adding to certifications for use in Canada and the European Union. Proteus Discover is a new “Digital Health Feedback System” created by Redwood City based Proteus Digital Health that uses a small patch worn on the body working together with 1mm sensor-enabled pills and a backend cloud service to provide real-time information on a users medication adherence. The platform is built around the wearable patch which monitors the status of the ingestible sensors and simultaneously collects data about a users heart rate, temperature, activity and rest patterns throughout their day. Resembing a grain of sand and made up mostly of silicon the tiny sensors are packaged in/alongside your pill regiment and are covered in magnesium and copper so that as the pills reach a patients stomach acid can generate enough power through this chemical reaction to communicate a unique time-stamped signal to the patch. The patch stores this number along with the exact time of pill ingestion and forwards that information using Bluetooth along to a users smartphone, with the details eventually ending up being delivered to a patients doctor or relatives that have access to the information. “Is grandpa OK and taking his pills today?” becomes an easy to access question for family members and caregivers, and physicians are able to monitor how a patient is responding to medicine using accurate and long-term data. Helius is currently being used in patients with heart failure and hypertension issues but plans to expand this to include other therapeutic areas like Schizophrenia and Alzheimer’s that pose especially difficult challenges in regards to getting accurate patient information. More details about the sensor technology involved can be found on the Proteus website here, or by watching an overview of the system in the video embedded below. New York City based start-up Adheretech is looking to add some intelligence to that orange prescription bottle by giving it 3G and LTE capabilities, an API, and adding sensors that can measure real-time humidity levels and how many pills or fluid ounces of the medicine remains in the bottle. 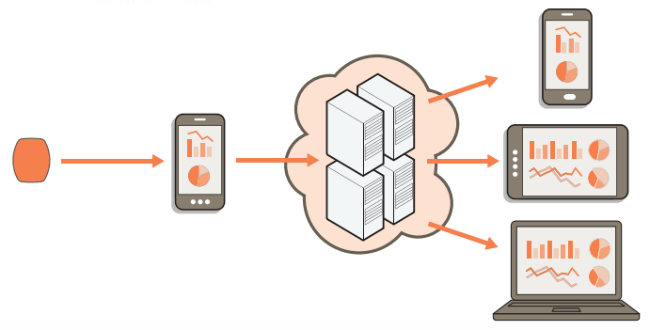 This combination of sensors and connectivity enable the company to wirelessly send this data into the cloud with HIPAA-compliant process to remind patients to take their medication via a phone call or SMS, and record anonymized adherence data for future clinical reference. Early results show an adherence increase from 60% to 90% as well as a reduction in hospital readmissions/added procedures when using a similar notification system for patients. Graduates of the Blueprint Health accelerator program and winners of the PILOT NYC health tech award Adheretech is planning on partnering with hospitals, pharmaceutical and insurance companies to have their bottles provided for use with certain medications that are very expensive or where not taking medications properly has more extreme consequences to the patient. 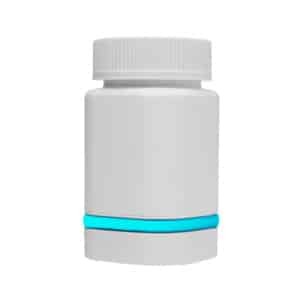 Similar technologies already exist on the market, but so far only measure simple metrics like if the bottle has been opened, and not whether the medication has actually been removed or how much is remaining. 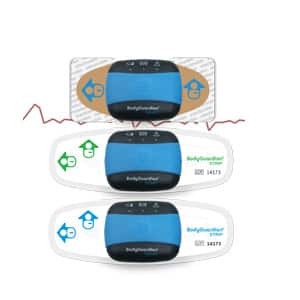 Intended for individuals with cardiac arrhythmias the BodyGuardian is an FDA cleared wearable sensor system that can remotely read a patient’s biometrics (ECG, heart rate (including variability and reliability), respiration rate and activity Level), sending the data to the service’s cloud platform via a combination of Bluetooth and later the patients cellular data network. The sensor features a bandage-like attachment so it can be easily placed on the skin and is powered via an integrated battery so the patient can go about their normal life without unnecessary restrictions from the device. Once in place authorized physicians and monitoring centers can access the data via a secure web portal or iPad application to create custom patient profiles or choose and manage alerts based on selected biometric changes in the individual’s data. Additional benefits stated for the device include a better level of customer care for the patients, earlier possible hospital releases and overall cost saving benefits over current hospital monitoring solutions. More details about the service can be found at: preventice.com/products/bodyguardian/ or watch some of the Mayo Clinic physician’s involved discuss the project below. 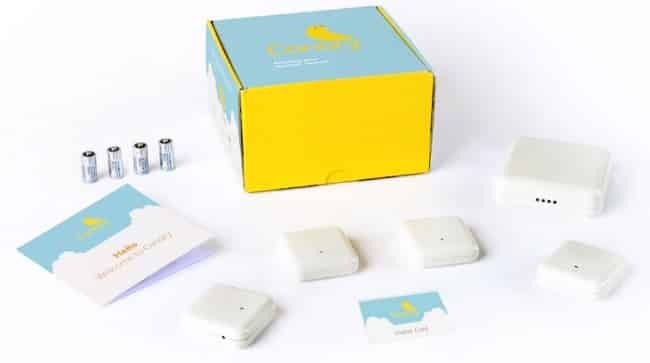 Canary Care is a home sensor network and monitoring service designed for the elderly or those with long-term care needs — people who want the freedom and independence of living alone, while giving their family and caregivers the ability to non-invasively keep tabs on their wellbeing. 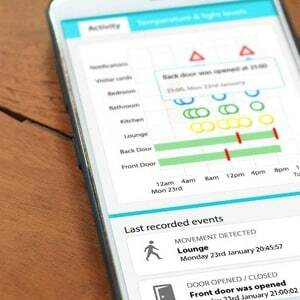 The system uses a network of sensors placed around the house to respond to movement, light and temperature, plus a card reader by the front door that allows expected, regular visitors — like a physical therapist or meal delivery service — to check in and out. The sensors all communicate with a local hub, which has its own mobile connection so it needn’t rely on a phone line or wireless network. 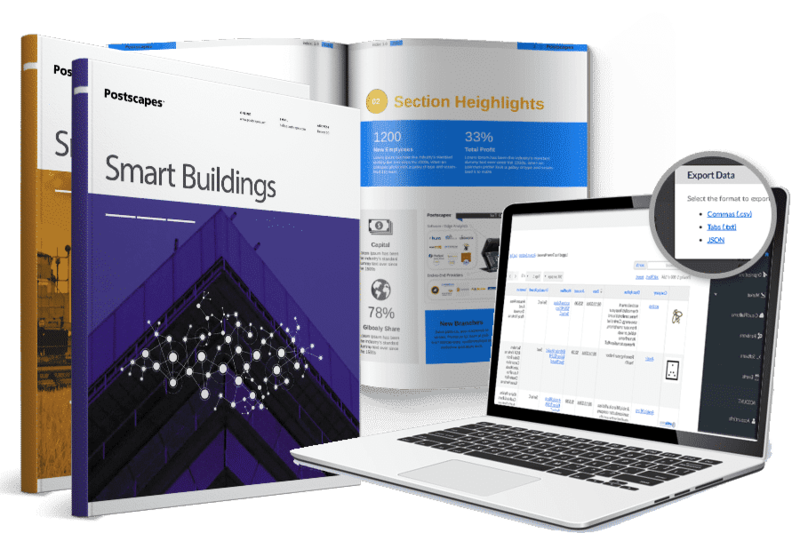 A web and mobile app present all of the real-time data, which shows a simple timeline of which sensors were activated when. Family members can also set conditions for alerts, so the system can notify them of anything out of the ordinary — like if there hasn’t been activity in the bedroom in the morning, or if it’s been too long between trips to the kitchen (and therefore, presumably, between meals), or if an expected visitor failed to check in on schedule. A U.K. company, Canary has been highlighted by the British government’s Digital Catapult Centre and has partnered with a number of other providers of “tele-healthcare” services. Learn more in the video below. Stethee is a Bluetooth stethoscope that lets users not only hear, but also see and feel a heartbeat. It goes far beyond the myriad pulse-tracking fitness devices to provide a direct window into the health of the heart itself, detecting problems like murmurs and arrhythmias that aren’t indicated by pulse alone. Heart sounds are streamed wirelessly to a mobile device and can be heard with any earbuds. 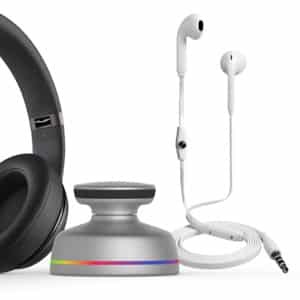 At the same time, the device vibrates and a pulsing LED ring lights up with each beat, providing tactile and visual feedback to enhance the experience. The lights are color-coded to indicate healthy beats or something out of the ordinary for the patient. Data is sent anonymously to Stethee’s cloud servers for processing. 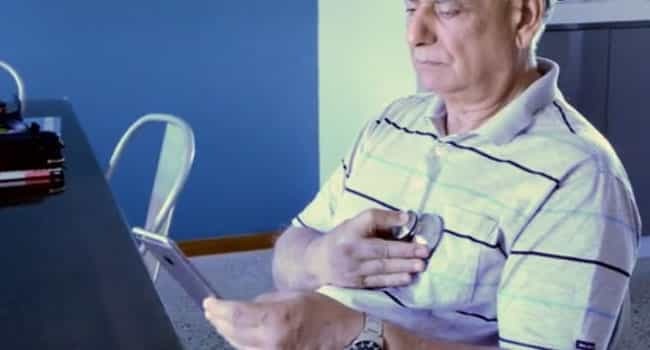 The company behind the device, Australia-based Medic8 Health, has drawn on medical databases and public health guidelines to create sophisticated algorithms that analyze heartbeats based on the age, personal and family medical history, and other qualities of the patient. Users can then choose to share that data directly with loved ones and healthcare professionals. 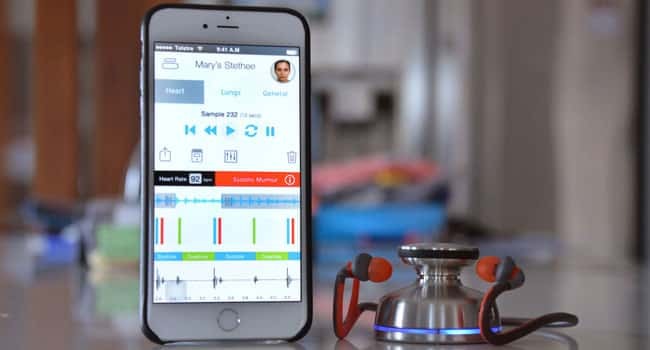 For added privacy and convenience, Stethee can also pair directly with Bluetooth headphones to act as a fancy traditional stethoscope, without syncing or sharing any data. The rechargeable lithium-ion battery lasts about four days of continuous use, and Medic8 Health recommends checking the level every month or so through the app if Stethee spends most of its time in a first aid kit or medicine cabinet. Even if you don’t have diabetes, you probably know that it requires frequent monitoring of blood sugar levels, which can be regulated with the drug insulin. But you may not know that insulin itself requires monitoring to keep the medication at safe temperatures so it doesn’t lose its effectiveness. 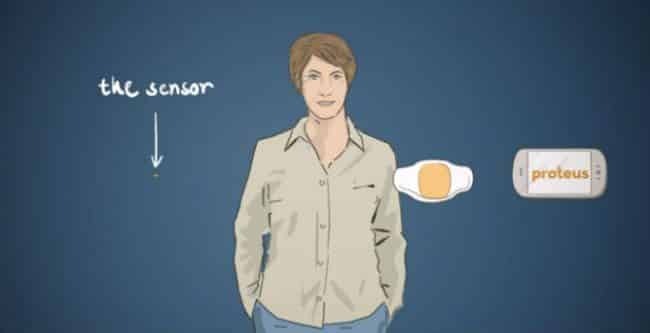 Insulin Angel is a temperature and proximity sensor designed especially to keep tabs on insulin and other temperature-sensitive medications. As long as the lozenge-shaped device is tucked in with the medicine, diabetics and their caregivers can receive smartphone notifications about unsafe temperatures, or if they’re about to leave their medication behind. The Insulin Angel mobile app is pre-loaded with recommended temperature ranges for dozens of common varieties of insulin and other drugs, and can be configured with custom ranges too. It even pays attention to weather forecasts and incorporates those into its notifications, which are meant to alert the user of an impending problem before the medication gets too hot or too cold. Proximity notifications are based on Bluetooth pairing, but include a geofencing feature so there won’t be false alarms while at home. Inside the device is a small, single-board sensor based on the WunderBar prototyping kit. It’s powered by a single, user-replaceable coin battery that should last for a year or more—to save power, Insulin Angel takes readings at five-minute intervals and communicates over Bluetooth Low Energy. There’s enough internal memory to store several weeks of temperature logs, so users can check that there haven’t been any unwanted temperature fluctuations even if their phone hasn’t been in range in a while. Relayr, the company behind WunderBar, also provides a cloud service that allows sensor data from Insulin Angel to be shared remotely. That way the parent of a diabetic child (or any caregiver of a diabetic person) can stay in the loop—whenever the device sends a Bluetooth notification to the patients’ phone, it will be passed on through the Internet to the parent or caregiver as well. Insulin Angel is raising funds on Indiegogo through May 8, and is planned to ship in June. The designers recognize that temperature control is especially challenging in the developing world, and have partnered with the Kenyan healthcare organization Access Afya to make it as easy for backers to donate a device as it is to order their own. Learn more in the video below. MonBaby is a wireless breathing and movement monitor for infants that sends instant alerts to a parent’s smartphone if it detects problems in the child’s breathing patterns or movement. The device snaps to a onesie or other clothing. It’s actually two parts—the electronics live in a rounded plastic disk that goes on the inside of the garment, and a thin plastic button snaps over it on the outside, trapping the fabric in the middle to create a tight seal. The enclosure is splashproof, as any baby-centric gadget needs to be. An accelerometer, Bluetooth Low Energy radio, and replaceable coin battery are MonBaby’s major components. Algorithms in the MonBaby app detect breath and movement, while the Bluetooth connection doubles as a proximity monitor for crawling escape artists. The battery should last a few months with normal use—MonBaby is designed mostly for use during naptime and can be turned off when parents are giving the child their full attention. From the accelerometer data, the app can pick up on a sleeping infant’s breathing rate. Then it can alert parents to changes that indicate the child has stopped breathing, or is starting to wake up. The sensor can also tell what position the baby is in and provide an alert if the child rolls onto its side or stomach—health authorities say infants are safest when sleeping on their backs. And for kids who are learning to walk, MonBaby can also detect falls. Future versions of MonBaby may include a microphone, and the company is exploring partnerships with makers of audio/video baby monitors—a natural fit, since MonBaby detects problems that may not be apparent from a lack of sound or motion. And though this device is intended for infants, its form factor and features could work just as well for adults who need a bit of extra looking after. Learn more about MonBaby in the video below. 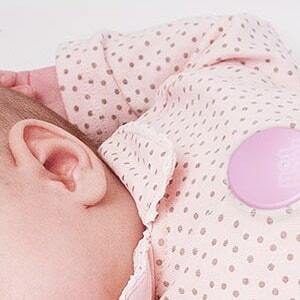 Tempdrop is a wearable thermometer intended to help women track their fertility. It works by monitoring basal body temperature (BBT), the natural low point in the body’s daily temperature cycle, which usually occurs during sleep, shortly before waking. BBT is a common method for figuring out when a woman’s body is ovulating, which is useful both for trying to get pregnant and for avoiding pregnancy through natural family planning — in other words, without using hormones or other forms of birth control. For most women, BBT increases by a small but measurable amount a few days before ovulation, when they are most fertile. And because the body only reaches basal temperature during sleep, a wearable thermometer is ideal for collecting enough data to accurately predict fertility. Tempdrop, which takes the shape of a flat, rounded teardrop, is worn at night by sticking it to the skin of the underarm or tucking it into a bra or armband. Temperature data is collected overnight, then beamed to a smartphone over Bluetooth Low Energy when the device is removed in the morning. Instead of creating their own app, the developers have partnered with a number of existing fertility apps to make the data easily accessible. The Tempdrop is available now for $150 or you can learn more by checking out the video below. 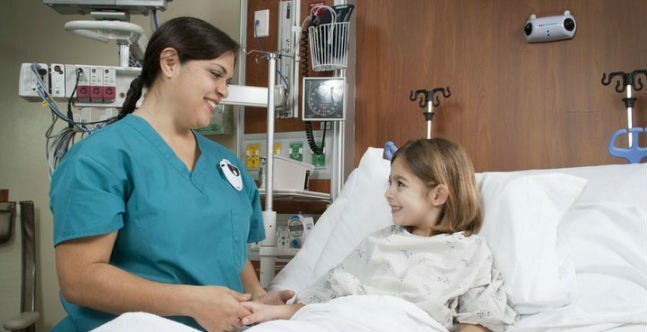 How are sensors and connectivity impacting hospital settings? Connected medical devices often focus on collecting and analyzing biometric data so that patients and healthcare providers can have a clearer real-time view into the diagnosis and treatment of a condition. Chilean startup Babybecomes at smart medicine from a different direction: Its first product, a mattress that connects premature babies with their mothers, is described as an “emotional prosthesis”. Premature births account for about 1 in 8 infants born in the U.S., and those babies often have to spend weeks in an incubator with only infrequent contact with their parents. Skin-to-skin contact or “kangaroo care”, in which the baby is held directly against the chest, can help parents bond with their infant and appears to have health benefits that shorten the child’s stay in the neonatal care unit—but this kind of contact is often only allowed for just a short time each day. Babybe’s mattress offers a way to simulate the kangaroo care experience while the child remains in an incubator. The pad is connected to a sensor unit that a parent can hold to their torso, where it detects their heartbeat and breathing patterns. Inside the mattress, which is made of a high-tech warming gel, pneumatic pumps inflate and deflate to recreate the physical sensations of a mother’s beating heart and the rise and fall of her chest. And of course, it’s all controlled by Intel’s Edison development board. While clinical trials will be needed to prove Babybe’s effectiveness, early test show that the device produces some of the same stress-relieving effects as skin-to-skin contact—improved blood pressure, reduced heart rate and calmer behavior. Babybe is being developed in partnership with the Fraunhofer Institute and the Olgahospital in Stuttgart, Germany. Learn more in the video below. The U.S. CDC (Center for Disease Control and Prevention) estimates that one of every 20 patients gets a hospital-acquired infection each year resulting in the loss of numerous lives and an estimated $28 billion dollars annually for the American health-care system. Originally developed out of research at the University of Florida HyGreen is designed to help stem the spread of these infections by recording all “hand hygiene events” in a hospital and gentle reminding healthcare workers to wash up before they interact with a patient. The system works using a combination of wireless sensors and device feedback notifications. 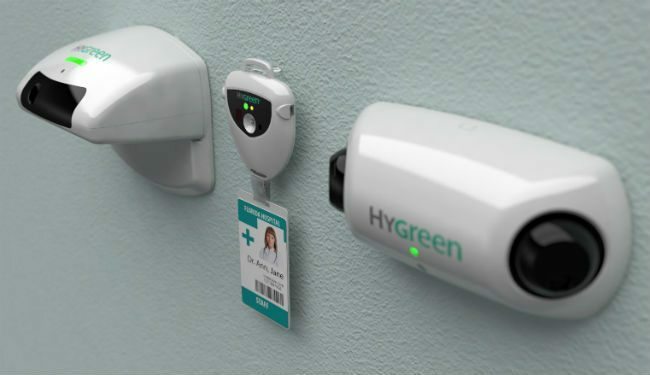 After washing up with soap or gel healthcare workers place their hands under a wall mounted HyGreen sensor. 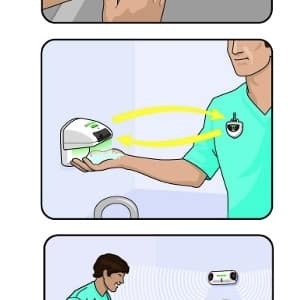 When this device detects there is alcohol on the workers hands it sends out a wireless “clean” message to a badge worn on the care providers shirt where it uses an LED to glow green to notify the patient of the process. 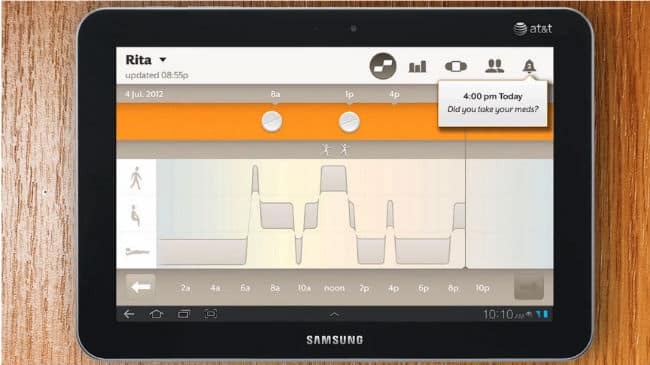 Near a patients bed an additional wireless sensor also looks for the message and if not detected will use the badges buzzing notification system to remind the worker to wash their hands before interacting with the patient. All of these interactions are recorded in real time showing exactly who on the staff is washing properly. 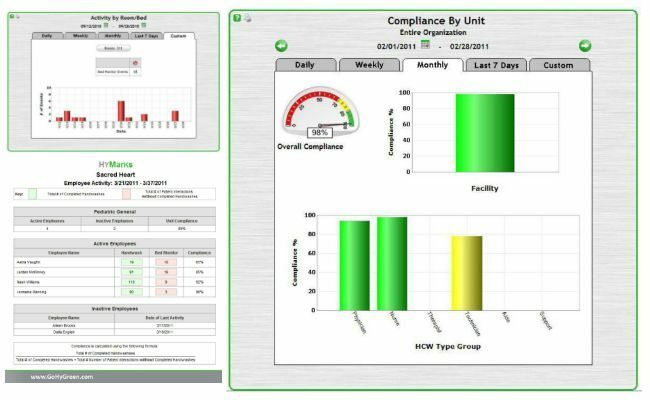 A health care workers ID, and the time and location of the interaction are all passed onto “HyMarks” the real-time reporting database where administrators can review the data and issue noncompliance warnings to individuals or specific units of a facility. More details about the system can be found at: Hygreen.com or in the overview video embedded below.